Which camera should I buy, the Nikon D750 or the D810? Comparing the D750 vs D810 to determine which one is better is a difficult task. The Nikon D750 is marketed as an action camera. The D810 is a medium-format competitor. These are two very different target markets, yet many of the camera specifications are quite similar. First, consider the D750. It is capable of 6.5 fps whereas the D810 is limited to 5 fps. For action, sports and wildlife photography the D750 has an advantage. The D810 has a 36 MP digital sensor and ISO 64 for capturing wide dynamic range and optimized for capturing detail at low ISO. The D750 base ISO is 100 and is optimized for low noise at high ISO. For landscape photography and studio photography the D810 is has an advantage wherever light is available and the subject is not subject to excessive motion. The D710 is better for events, people, animals and low-light and night photography where high ISO is necessary to stop motion. Both the D750 and D810 cameras have a durable build. The D750 has a combination body of magnesium and carbon composite material, The D810 has a full magnesium alloy body and chassis. The D750 body has a top and back made of magnesium, the front is made of a carbon reinforced thermoplastic material. Both are fully weather-sealed. Both are built to withstand the rigor of daily use by a professional photographer. For many purposes either camera will work. Each camera is specialized to excel at a particular type of photography. The D750 will appeal to those who want a full featured full-frame camera but might not have the budget for a $3,300-$6,500 camera like the D810 or D4s. The D750 has a base price (body only) of $2,299. The D810 is a major update to the amazing D800 and a dream come true for landscape and medium format photographers. Another way to determine which camera to buy is to consider at the way you currently shoot. If you carry a backpack or camera bag full of gear, prime lenses and a tripod and take time to set up each shot to get it perfect, the D810 is probably going to match your shooting style. Whereas if you carry your camera at the ready, need to move fast, travel light, use a zoom lens, rely on VR rather than a tripod, make use of Continuous High shooting mode shooting, shoot at odd angles and high/low shots, or shoot lots of video the D750 is going to be a better fit. Those shooting video may prefer the D750 because it offers a tilting LCD screen. This allows for a variety of unique camera angles that would otherwise be difficult without an external monitor. The screen tilts up and down to shoot from high above or ground level shots. Both cameras offer many advanced HD video features: flat picture profile mode, built-in stereo mic, uncompressed HDMI output, 24/25/30/50/60p video at 1080 HD resolution, power aperture for smooth transitions during video recording, auto-ISO with manual mode controls, zebra stripes for highlight display. The D810 weighs in at 880 grams, the D710 weighs 750 grams. Both quoted without battery and memory card (they use the same battery). A total weight difference of 4.6 oz. The D750 is smaller by a fraction of an inch in each dimension: 5.5 x 4.4 x 3.1 inches whereas the D810 is 5.8 x 4.9 x 3.3 inches. One final advantage of the D750 is its built-in WiFi. The D810 only offers this as an expensive external add-on unit. The D750 is ready to go and can be controlled remotely using a tablet or smartphone, including remote shutter control and monitoring of live view display. Be the first to get the new Nikon D750. 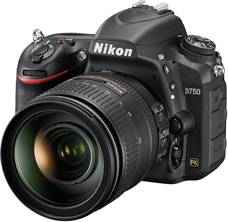 See the Nikon D750 Pre-order information page for a list of retailers offering the D750. By ordering as soon as the camera is announced you will be assured early delivery. Thanks for side by side comparison of these two cameras.I have F60 ,D 7000 and D600 and have owned D90. I am leaning towards the D750 ( when it gets reintroduced) but I worry that changes maybe made to its AF system thus affecting the resolution.I do some macro photography using Nikkor 105 mm lens and have placed an order for you new 20 mm lens for astrophotography.The lenses I own have good optics and I hope that D750 will be OK for them. Excellent comparison. will remember that. I just got upgraded to D 750, I will stick to that. i am very satishfied for comparison of these two camera .